When Slave Ambient hit in 2011, it was needed more than ever. There needed to be a band that combined classic rock with 80’s and 90’s elegance. The main single off the album, “Baby Missiles” sounded exactly like a mix of Paul Simon’s “The Obvious Child” and Neu’s “Hologalo”. The singer recalled both Tom Petty and Bob Dylan, while the band recalled Dire Straits and their most chilled out. That ambient quality though, the one inherited from bands like Stereolab and Jesus and Mary Chain, prevails over the classic rock just enough to make it sound timeless. “I Was There” owes more than a little bit to Rickie Lee Jones; even obscure references come though like Everclear and Band of Susans in certain place. 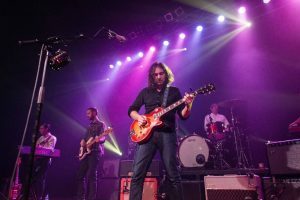 The defining songs- “Best Night”, “Come to the City”, and “Your Love is Calling My Name” achieve a perfect mix of all of the rock innovations of the last 50 years to such a perfect extent that it may turn out that War on Drugs DEFINES the sound of the 2010’s. In fact, if any band does as of 2015, it is War on Drugs. What is funny is we didn’t even know we needed them. The follow up to the brilliant Slave Ambient definitely follows a different path. The songs are longer and get to breathe more and it is more suited to a driving experience. “Under the Pressure” kicks it off and kind of sums up the record: beautiful, ambient, synth heavy, overblown, ambitious. When the songs work like that one works, the record is a gorgeous experience. “An Ocean in the Waves”, “Eyes to the Wind”, “Burning” continue on this path, and it does mix the old (Tom Petty, Bruce Springsteen, Dire Straits, etc.) with the new (Yo La Tengo, Stereolab) in bold ways. Is it overlong and bloated? Well, I don’t really think so. Rather it requires a certain kind of patience that a lot of music does not; it expects you to come down to its level. It makes War on Drugs a unique band in our era: they are not an alternative/indie rock band at all: they are classicist and traditionalist in the best sense of the words. War on Drugs made a very interesting choice for their 4th lp, in that they did decided to make a true double album: all long, wondering songs that sound similar to each other but when placed side by side create more than the sum of their individual parts. Don’t get me wrong, each song is distinctive enough, but also of a piece and rather homogenous when all heard together. It is one of the few albums in recent memory that I would recommend to listen to perhaps 3 or 4 songs at a time, as each beautiful guitar solo or melody is in the same fashion of the song before, almost combining the ambient aura of their masterpiece, 2011’s Slave Ambient, into the classic rock formula of the bands they love : Tom Petty, Dire Straits, Bruce Springsteen, Bob Dylan. Opener “Up All Night” has the mix of dance grooves and AOR guitar rock gloss that makes the band a joy to listen to , and the guitar solo is the highlight of the following song “Pain”. “Holding On” would have fit on the last record, but somehow the sound seems more up to date, where as a true breakthrough comes through in the slowcore ballad “Knocked Down”, which mixes ambient laid back atmosphere with power lyrics, “I wanna love you but I get knocked down”. “Thinking of a Place” is their longest song yet at over eleven minutes, and it earns its epic length with the albums best guitar solo yet and proves the band a force to be reckoned with. “In Chains” is perhaps the best track, summing up everything that is great about guitar rock in the late 2010’s. Some of the tunes are perhaps too long (“Strangest Thing” and “You Don’t Have to Go”) or could have been left off completely (“Nothing to Find” and Clean Living”) but that seems like nitpicking on an album of rare consistency. For its near 70 minute length, this album holds the listeners attention and provides surprises at every turn. Songwriting of this kind is very old fashioned, but also immortal. And credit is due for having an average song length of six and a half minutes!